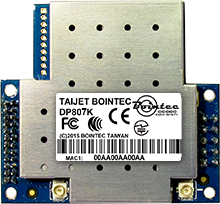 Bointec DEV806 Evaluation Board (EVB) is a highly flexible platform to evaluate the performances of DP806K and DP807K, the Bointec cost-effective module solutions which can support the internet of things, IoT. DEV806 provides an efficient, quick and simple way for all users in order to develop all the required features. 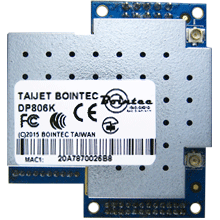 Moreover, all the users can use the software, the quick guide of command and serial-to-WiFi software package from Bointec based on DEV806 evaluation board and the SDK of DP806K and DP807K. The DEV806 EVB brings out all the pins of DP806K and DP807K modules. Our clients will have a great advantage and flexibilities based on our design. It is truly convenient for our users to choose the pin header interface or a connector interface such as RS232 or USB……etc. based on the jumpers. Regarding the interfaces of DEV806 EVB, it contains the most common interface including UART of the pin header, USB and RS232 , GPIOs , miniPCIe with PCIe bus or w/o PCIe bus (USB only), 10/100 Fast Ethernet of pin header and RJ45, I2C,I2S and USB from the DP806K and DP807K module. The DEV806 EVB is a part of SDK according to DP806K and DP807K. Thus, considering the software development, it is truly beneficial for all users to build up and connect to their host board or custom application boards. All in all, Bointec DEV806 evaluation board provides the all required hardware and software including the user manual and the quick guide of command. Our clients can easily use the various jumpers, switches, push buttons, USB (Host and Slave), RS232 and pin headers in order to evaluate different features and configurations based on the firmware loaded.